The November prize was sponsored by Walker and they offered a fantastic prize pack of books signed by the lovely Zoe Marriott - The Night Itself, Darkness Hidden, Shadows on the Moon, The Swan Kingdom, Daughter of the Flames and Frostfire. Congratulations Chrissi! You have 1 week to email me with your address or a new winner will be chosen. By sending me your address you are agreeing that I can share your details with my lovely contact at Walker so that they can send out the prize pack for you. I've decided to sponsor the December prize pack myself so that I can make sure the giveaway is open for our international participants as well as the British ones. I've decided to let the winner choose any book of their choice from The Book Depository (up to a maximum value of £7) as long as the book is written by a British author. It can be an old book or a new release, even a pre-order of a 2015 title you're excited about (as long as you're happy to wait for the prize to arrive! ), any genre, any age range, absolutely anything goes as long as the author is British! It's that time of the year when it's time to start thinking about which 2015 challenges you want to sign up for. 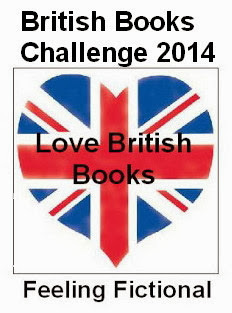 While I've absolutely loved hosting the British Books Challenge for the last two years, and I hope you've all enjoyed taking part with me, it's time for me to pass the baton over to another blogger and I'm thrilled to announce that Michelle from Fluttering Butterflies will be hosting the challenge for 2015. I'll definitely be signing up to take part in the challenge & I'm quite looking forward to being a normal participant again (and getting to enter for the chance to win the prize packs!) so I hope you'll all be joining me. You can find all the detail and the sign up page on Michelle's blog HERE. It's been a fun challenge this year, I managed 13 books so far for this event. Definitely signing up for next year's challenge. It's been wonderful having you, Sarah. Especially stepping up as you have to ensure, not only that Canadians etc are eligible for prizes. Non-'YA' fans (being age 42!) thank you greatly for this option, that lets us choose. You KNOW I have awaited this month excitedly and saved all of my reviews all year! So here they come! Don't worry too much about the wording on the entry above, I know it's sometimes impossible to fit blog details, the author name and the book title in there :o) Just put in as much as you can and as long as it links to the correct post on your blog I'll be able to figure it out. Ack! One can't see how an entry turns out until its through. In #18, please use (C. Riedel) so author Marian Babson comes out. In #19, remove my name entirely and fix the typo in "Phantom". The author is Christine Pullein-Thompson. I don't think I can actually edit the links once you've entered them. I think you should be able to delete entries you add yourself but don't worry if you can't. Like I said before errors happen in the linky posts & it's not the end of the world as long as they link to the right review on your blog :o) You can always let me know about any errors in the comments though so I know what I'm looking for. Thank you for hosting, Sarah! I hope you've had a wonderful Christmas & that 2015 is a brilliant year!